Titolo: Minecraft. Distribuito da: Sony. Lingue: Italiano. Sottotitoli: Italiano. Requisiti minimi di sistema: N.d. Contenuti speciali: N.d.
L'acclamato Minecraft arriva su PlayStation 4. creare il vostro mondo di gioco ed esplorare, costruire e conquistare. eoutlet è una divisione di Inspire Tech UK LTD dedicato alla vendita di elettronica di consumo e computer connessi qualità a bassi prezzi competitivi. • Spiele zu viert auf geteiltem Bildschirm oder sei online mit bis zu sieben Freunden kreativ. • Was du in der Welt erschaffen und tun möchtest, bestimmst allein du – und die einzigen Grenzen setzt dir deine Fantasie. • Spiele zu viert auf geteiltem Bildschirm oder sei online mit bis zu sieben Freunden kreativ. • Erlebe das von den Kritikern gefeierte Spiel, das die ganze Welt im Sturm erobert hat – jetzt auf PlayStation 4. Als Schöpfer stehen dir alle möglichen Materialien zur Verfügung. Baue Steine ab, um steinerne Strukturen zu bauen, oder baue Pflanzen an und züchte Tiere, um sie im Handel mit Dorfbewohnern gegen andere nützliche Gegenstände zu tauschen. In Minecraft: PlayStation 4 Edition beginnt dein Abenteuer mit deiner Fantasie. Findest du einfach heraus, wie tief du graben kannst?. Baust du dir einen Unterschlupf, bevor die Kreaturen der Nacht erscheinen?. 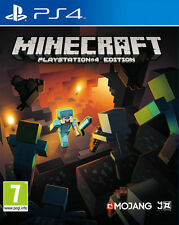 VIDEOGIOCO MINECRAFT PS4 GIOCO SONY MINE CRAFT PLAYSTATION 4 ITALIANO PAL NUOVO. La condizione Nuovo. Spedito con Posta 1 extra standard. We pride ourselves on our reputation for ensuring all orders are quickly processed and despatched. We will advise which is applicable. Why choose us?. In special circumstances this may not be possible. Condition - The game is in good used condition showing moderate signs of wear and tear/scratches. Working Order - The game has been tried/tested and is in full working order. What's Included? 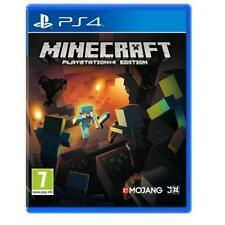 - Minecraft Sony Playstation 4 Game Disc & Case. Build! Craft! Explore! Discover a world with the freedom to do whatever you want. Dig down into the unknown depths or build incredible structures, from humble homes to grand cityscapes. Go it alone or bring your friends along for the ride. The only limit is your imagination. Learn your way around one block at a time in the new tutorial mode. Craft all sorts of items from boats to diamond armour and create enormous structures. Team up with friends in eight-player online multiplayer and four-player split screen modes. In the wake of an epic battle, the Guardians discover an artifact of unspeakable power. Each of the Guardians has a reason to desire this relic, as does a ruthless enemy who is the last of her kind, and who will stop at nothing to tear it from their hands. Compatible with Sony Playstation 4. 50 classic Atari and arcade titles remastered and bundled on one disc. If you can imagine it you can create it. Creative and Survival. You can play both of them in multiplayer. If you’re mostly interested in making huge structures from scratch with unlimited resources, Creative mode is your best bet. Discover a world with the freedom to do whatever you want. Go it alone or bring your friends along for the ride. The only limit is your imagination. Show your creations to the world with a touch of the SHARE button, and explore, craft and build with up to seven friends online or up to three friends in offline split-screen mode. Discover a world with the freedom to do whatever you want. Go it alone or bring your friends along for the ride. The only limit is your imagination. New & Sealed. Team up with friends in eight-player online multiplayer and four-player split screen modes. Rise of the Robots (PC).